​Benjamin Orr was the co-founder, co-lead singer, and bassist for the platinum-selling rock band The Cars. Often considered the band’s heartthrob, Orr possessed an incredible voice, diverse musical talent, and rare stage presence, all balanced by an enigmatic personality and a relentless determination to reach rock stardom. Selling over 30 million albums worldwide with fifteen Billboard Top 40 hits, The Cars certainly achieved success. Within a decade of the debut album, though, Orr found himself adrift and without a band. Veteran music journalist Joe Milliken draws together interviews with over 120 family members, friends, bandmates, and music associates from Orr's life, as well as many unpublished and never-before-seen photos from private collections, to reveal an intimate portrait of one of classic rock’s greatest talents. From Orr’s first performances as a house-band musician for the Cleveland TV show UpBeat through his creation of The Cars with Ric Ocasek to Orr’s eventual rebirth with the supergroup Big People, this definitive account of Orr’s life is a rollercoaster ride that sheds new light on the history of The Cars. ​Orr is no longer able to rock with The Cars, but the music he made with them continues to attract new generations of fans. Coinciding with the band’s 2018 induction into the Rock & Roll Hall of Fame, this first-ever biography of Benjamin Orr immortalizes his legacy as a deeply kind-hearted and exceptionally talented musician who would stop at nothing to live his rock and roll dream. Released on ​November 11, 2018! Let’s Go! 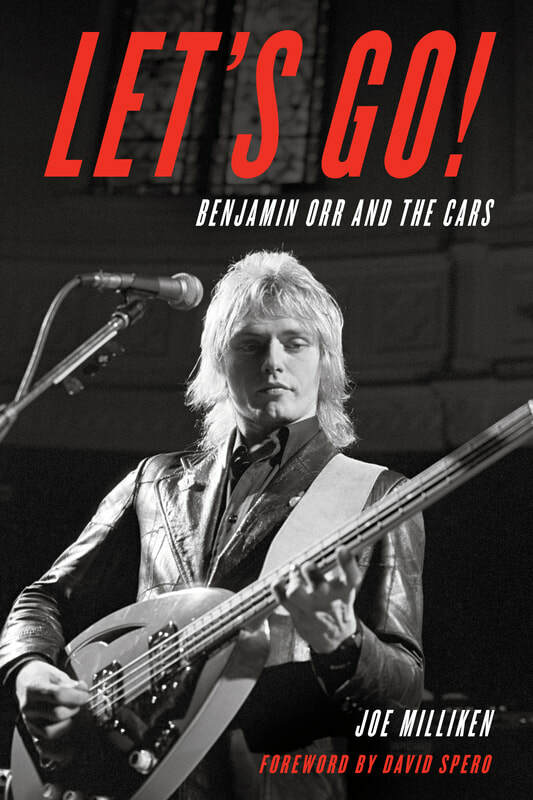 Benjamin Orr and The Cars is now available for purchase! You can buy the book directly from Rowman & Littlefield using the button below. Apply the discount code RLFANDF30 and receive 30% off! Let's Go! is also available through Amazon, Barnes & Noble, and other online retailers. Get your copy from Rowman! If you have read Let's Go! and enjoyed it, please consider posting a review online at Amazon or Goodreads. Doing so will help others find the book, improve its search ranking, and encourage customers to buy. Thank you, as always, for your love and support! T-shirts, mugs, stickers, and notebooks with the book cover art! featuring two original designs by Kurt Gaber​! ​website publisher for 20 years. In 2014, he launched Standing Room Only (http://www.standing-room-only.info/), a website dedicated to promoting music, the arts and specialty food on both a local (Boston, New England) and national level. Originally from Boston, he now resides in southern Vermont with his wife, Kelly, and his children, Nate and Erin. Let’s Go! is Joe's first book.